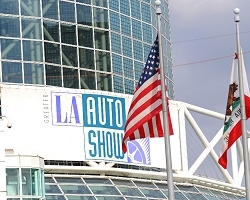 Although the LA Auto Show is nowhere near as significant as the major internationl motorshows it always throws up a few important debuts. The 2009 event was no different. 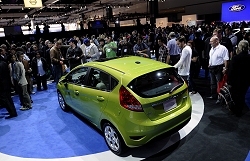 There was a mood of cautious optimism at the LA Auto Show behind all the usual glitz and razzmatazz. While every launch and unveil was accompanied with the standard buzzwords of “class leading” and “world first”, the reality was an industry slowly rediscovering its confidence. The US market has taken a hammering over the past couple of years and many American car drivers are still in shock at the arrival of $4-a-gallon fuel. No wonder fuel efficiency featured large on many execs lips and in plenty of press releases - even the Ford Mustang has caught the economy bug. Here's a quick rundown of what was on display. Click on the brand links to the left to access the full articles. The LA Design Challenge has its own dedicated page. BMW's amazing hybrid sports car concept makes its Stateside debut in LA. The EfficientDynamics Concept uses a 1.5-litre turbodiesel engine and two electric motors to produce 163bhp, but with 214lb.ft of torque it's also good for 0-62mph in less than 5.0 seconds. All this and it still notches up 62.6mpg average economy. Caddy gets back to doing coupés the right way with the sleek and, dare we say it, glamorous CTS Coupé. It's a sharp looker alright and the signs are good that it will also be a fine drive. There's also a CTS-V on the way in 2012 with a 556bhp supercharged V8. Strangely for an American brand, Chevrolet has launched the Cruze in the States after its European launch. It has come at the right time for Chevy though, as fuel economy becomes an every more important topic in the US and small cars are selling in every greater numbers. 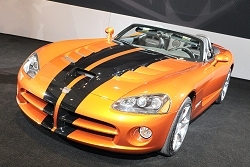 The 8.4-litre V10-engined Viper soldiers on, though 2010 will be the final year of production for this model before a replacement is developed. To mark the occasion Dodge will sell just 500 more examples with plenty of new colour choices and a few limited editions to further tempt fans of the iconic all-American sportscar. One of Europe's favourite small cars heads west to find America waiting with open arms. The US version only comes with a 1.6-litre 118bhp petrol engine, but 40mpg will win it many friends and customers in the newly consumption-wary US. A dual-clutch gearbox is an option that should cross back over the pond to Europe. A lightly restyled Mustang is almost a given for any big American motor show, but the real news is under the shapely bonnet of this 'Stang. It packs a new 3.7-litre V6 motor with 305bhp that is capable of 30mpg - and that's with a six-speed auto 'box. Pony cars have never looked so good. 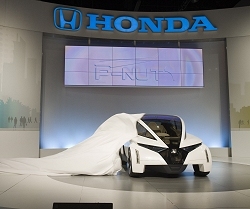 Honda handed a headline writing gift to us in its 'P-NUT' concept, but the show car should be taken more seriously. It's a highly attractive three-seat city car featuring rear-wheel drive and space for a variety of powerplants. 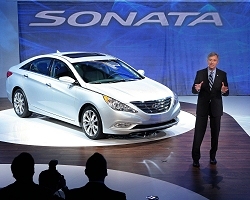 The new Sonata was the surprise of LA, Hyundai borrowing more than a few styling cues from the Mercedes-Benz CLS to create a highly individual and, dare we say it, desirable, replacement for the dowdy four-door saloon. 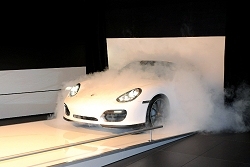 We expect the company to rename the car when it arrives in Europe. Hot on the heels of its world debut at Frankfurt, the Hyundai Tucson touches down in the US where it needs to be a sales hit. The latest Tucson is new from the ground up and US buyers can choose from 2.0- and 2.4-litre petrol engines, though European buyers will also be offered a 2.0-litre turbodiesel. The monster Merc says hello to its biggest sales market for the first time at the LA Auto Show. It may not be brand new to car fans, but visitors to the LA event have given the SLS AMG a very warm welcome, which is just what Mercedes hoped for in a town where it will sell plenty of them. Now confirmed for production, the MINI Coupé may be small but it's making a big impact in LA. Show goers love the looks and a 208bhp John Cooper Works engine should do the trick on the road. The MINI has been a huge sales success in the US and the Coupé should follow up in fine style. An open-top sports car and LA sunshine - what could be a more appropriate match? MINI has got it spot on with the Roadster, which takes the Coupé's low-slung good looks and chops the top off. American MINI fans are already queuing up to lay down their deposits. The fit, finish and styling of the PX-MiEV all point towards this car being a whole lot closer to production than Mitsubishi's men in suits are prepared to say. It uses two electric motors - one for each axle - and a 114bhp petrol engine to charge the batteries or power the wheels directly. Mitsubishi claims 117mpg is possible, which will appeal to America's SUV fans. One of the undoubted stars of the LA Auto Show, Porsche knows its audience only too well and where better to launch a Speedster version of the evergreen Boxster than its spiritual home? The lightweight Porsche has a simple canvas roof that's more umbrella than all-weather hood, so Los Angeles is the perfect place for this stripped out machine. 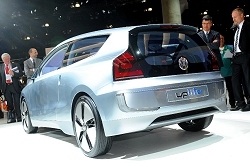 VW's Up! concept grew for the LA Show, but it's still a tiny car by US standards. 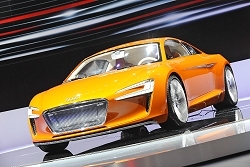 The latest iteration features seats for four in a long two-door shape reminiscent of the Audi A1. It's even closer to production than before too, as indicated by the "Final Edition" badges. We're not convinced that cameras will replace mirrors on the eventual showroom version.